Having read a lot of good reports about the crystal polishing product Polywatch of late, I obtained a tube to see just how good it was. For the past couple of years I have been polishing the acrylic crystals on my vintage watches with an automotive metal polish called Autosol, and have found it to be very effective. Was Polywatch better? This was what I decided to find out. Checking the results of the polishing both visually, and under a 10x microscope, no discernable difference was noticeable on either half of the test crystal. Both polishes seemed to have reduced the scratching to the same degree, and the clarity of the crystal was also the same. A similar light grinding sound was apparent when using both polishes. One extra test I wished to run concerned the effect of the two polishes on a celluloid crystal. 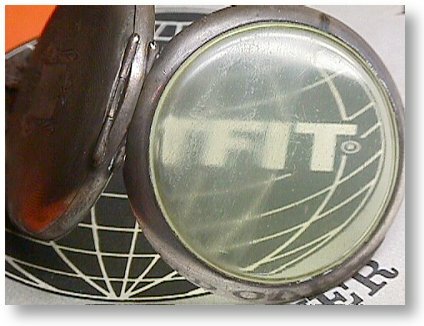 These crystals are often found on the older vintage timepieces, sometimes signified by the discoloration (yellowing) of the material that occurs over time. Celluloid can be affected by compounds that are harmless to the more inert acrylic crystals. occurring. It became increasingly difficult to polish, as the surface of the crystal was being dissolved by the Polywatch. The celluloid became soft and sticky to the touch, and was left clouded. Autosol was applied to the other half of the crystal, and after 2 minutes of polishing very little effect was noticeable. There was no reaction with the celluloid, and neither was there a great amount of polishing noticeable. 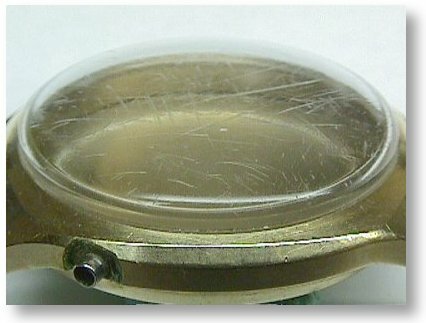 Below you can see the effect of the Polywatch on the celluloid crystal, with the the left half being very visibly clouded. The damage was also very easily felt as roughness. 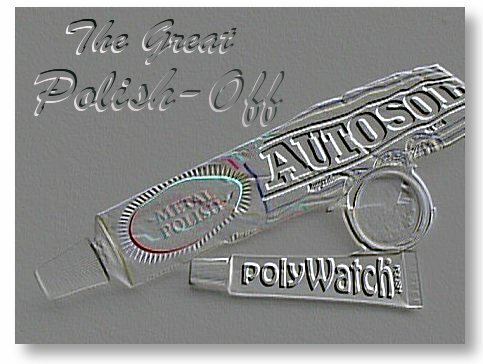 The results from these short tests indicate that Polywatch and Autosol are equally effective in polishing acrylic crystals, and are very useful products for this. 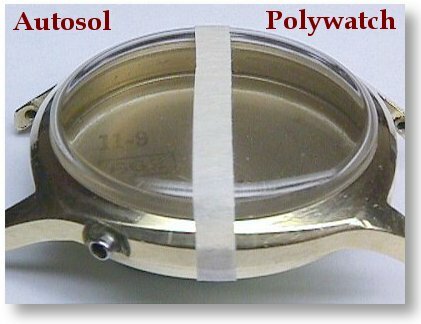 I have also successfully used Autosol on Stainless Steel watch cases, and have heard of Polywatch being used on watch cases also. Care should be exercised with gold or gold-filled cases, as these polishing compounds are quite abrasive, and heavy application could remove more metal than is necessary, or desirable. My test showed Polywatch to be unsuitable for polishing celluloid crystals, having a reaction with this material which softens it. Autosol has no detrimental affect on celluloid, but is not nearly as effective at polishing this material as it is with acrylic. Thanks to Rob B for donating the test crystals. Text and pictures copyright 2000, Paul Delury.